Pop Authentic explores the possibilities of pop art in the 21st century in relation to the rampant appropriation of social media self-branding. This pop appropriationist gesture—while significant for its commentary on art production, and all the more relevant thanks to retweets and reblogs—capitalizes off foreign labor, usurping credit and amassing fame. Many of the pop art greats owe much of their artistic production and financial compensation to their sources of labor and inspiration. How does one reclaim what has been appropriated? How does performance reenact lost histories? how can we take back what is ours? 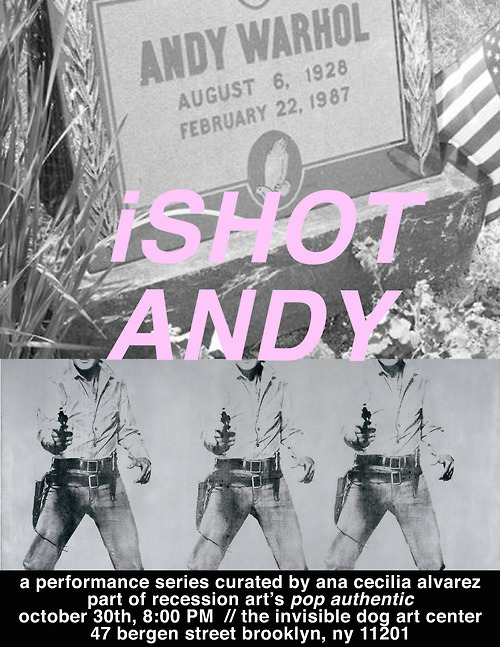 In the spirit of valerie solanas’s manic attempt to retrieve her lost work, iSHOT ANDY invites inappropriate appropriations that recapture voices silenced in the name of pop. The performances and videos in iSHOT ANDY reclaim appropriation from the passive regurgitation common in the everyday performance of social media. The resulting works appropriate in a manner that is intentional, critical, and in its own way—new. In some, marginalized voices center their cries over the words of their oppressors. In other, mimicry points a finger at the end of uniqueness in the digital age. All interventions pull a trigger. iSHOT ANDY features videos and performances by Genevie?ve Belleveau , Andrea Crespo. Kate Durbin, HAG, Laura-Marie Marciano & Marisa Maffeo Robinson, Grace Miceli, and Tinuade Oyelowo. The night of performances is curated and produced by Ana Cecilia Alvarez, a writer and independent curator living in Brooklyn, NY.